Layered haircuts for short hair	are super cute and stylish when done right, but unfortunately it’s a look not everyone can pull off. To enumerate just how many great cuts there are in this style, here is a list of 51 short layered haircuts and hairstyles that you’ll fall in love with, as well as tips on who should wear short layered haircuts. What Face Shapes Are Best for Short Layered Haircuts? John Frieda, an iconic master hair specialist, created his own formula taking a ruler and aligning it starting under your ear and vertically down your face. Second, you take a pencil and position it under your chin so you can figure out the exact measurement, as noted by where the pencil intersects with the ruler. Any measurement under 2.25 inches suggests that short layered hairstyles will be flattering. Without the formula itself, some layered haircuts for short hair make it easy to tell if they will work well or not just based off of the overall face shape. Pixie haircuts, for instance, look especially nice on round faces due to their ability to soften roundness while drawing attention to the eyes and cheekbones. Other face shapes good for short pixie layered haircuts are heart, oval, and square. Edgier or asymmetrical short layered hairstyles are great for women with oval-shaped faces. However, those with long face types will find it more difficult to pull of short layers, and might want to consider instead a longer layered haircut, since they will help broaden a narrow face. As someone who’s always secretly considered getting a short layered haircut, it’s nice to know there’s a simple way to figure things and get some more reassurance for such a big change ” especially when there are so many different, totally adorable and edgy layered haircuts for short hair! This blonde style is a timeless haircut for short hair. There’s always been something whimsical and cute about this style, only in part because it’s reminiscent of Tinker Bell and her fairy charm! 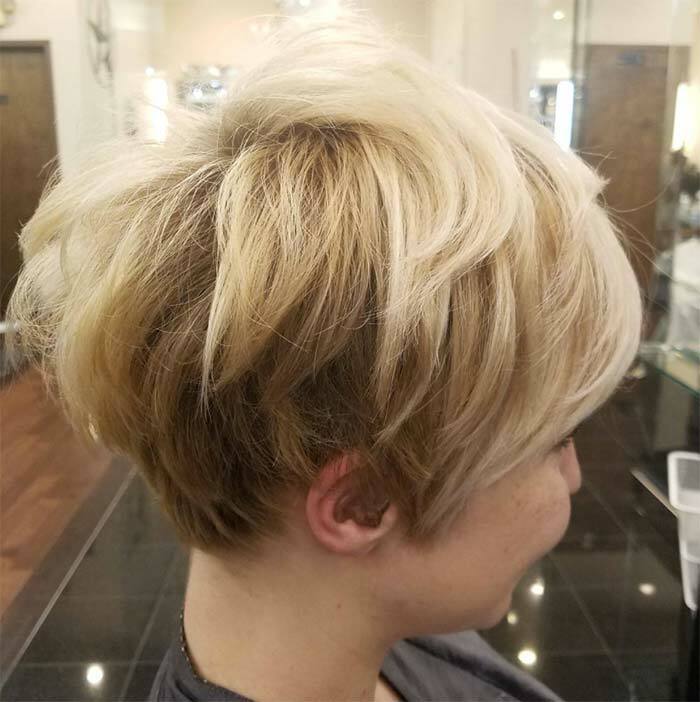 This is an especially short style, so it’s perfect if you’re looking for a drastic change, or even if you’re looking to trim up a short hairstyle. The short layers make it that much cuter, with the added volume.